When did you visit a Challenger Learning Center? I was in the 3rd grade when I flew my first mission, but I attend summer camps and flew several missions every summer. I even ended up assisting on missions once I was old enough to work there. What do you remember most from your experience? I always requested Probe team. I did upwards of 15-20 missions throughout grade school, and I always wanted to be on Probe. Have you always been interested in STEM? STEM has always been a huge motivator for me. 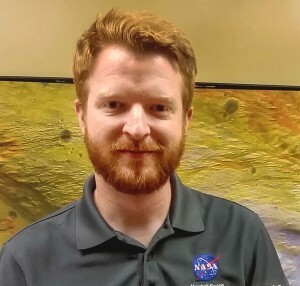 Working at NASA has always been a goal of mine, and the Challenger Learning Center at the Coca-Cola Space Science Center gave me the experience to get there. Did the visit to the Challenger Learning Center affect your decision to pursue a STEM degree or career? If yes, how? The Challenger Learning Center was fortunate to have many astronauts visit and give lectures. Those talks, along with the resources provided by the Center, cemented my decision to pursue a STEM degree and career. Why is STEM education so critical at a young age? So many critical thinking skills are taught through STEM methods. Even if you never enter a STEM field or pursue a STEM degree, everyone can benefit from these core critical thinking skills. What advice would you give to students who want to pursue STEM degrees or careers? Don’t be afraid to fail, and when you do fail brilliantly. Failure is the best way we learn and can improve. Why should people support Challenger Learning Center’s STEM programs? I’m not going to do this question justice. The best explanation for support is simply to get a group together and try it yourself. You’ll be surprised how much you learn about working with your peers. In one sentence, how would you describe your Challenger Learning Center experience? Engaging, motivating, and a whole lot of fun.